MANILA, Philippines - Online sensation Angelica Jane Yap known as 'Pastillas Girl' finds closure with her bestfriend Karen, the present girlfriend of ex-boyfriend Enzo in It's Showtime's AdVice Ganda segment on Friday, September 25, 2015. As Karen visited the show as part of the hit 'Nasaan Ka Mr. Pastillas' TwitterSerye, she said sorry to 'Pastillas Girl' as she fell in love with Enzo. "Sorry kung nasaktan kita. Nagmahal lang naman ako." Yap who turned emotional immediately asked if she can hug her bestfriend. Enzo who was revealed last Saturday visited It's Showtime today to seek forgiveness in front of new found love and ex-girlfriend. "Sorry sa'yo. Thank you so much," Enzo told Ms. Pastillas. While in tears, Yap said "Happy na ko para sa inyo. Sana magtagal kayo." 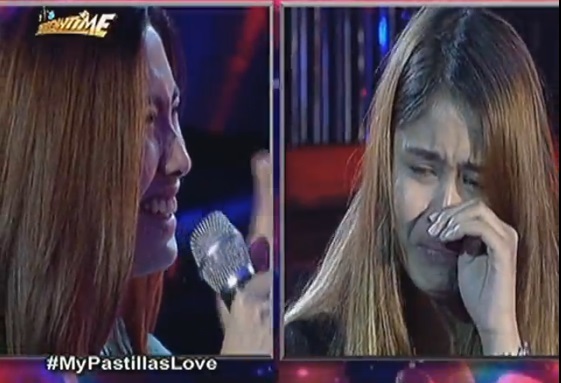 WATCH: Ms. Pastillas emotional closure with Karen video here. Meanwhile, netizens shared mixed reactions on #MyPastillasLove episode on Friday.